Note: This tab is available on in X_TRADER 7.17.30 or higher. The Legacy tab provide access to settings that existed in pre-7.17 versions of X_TRADER and were removed in X_TRADER 7.17. Text color for Buy orders is blue. Text color for Sell orders is red. Sets the number of days Audit Trail log files remain in a database. Files are located in: <root drive>:ttlogfilesAuditLog. Note: If you use automated tools, like Autotrader or Autospreader, change the days kept to the minimum of three (3). Logs some actions you execute via mouse clicks or keyboard strokes. Example: Delete in the Order Book is always logged. MD Trader actions are never logged. Shows alert messages like FILL SERVER IS DOWN. Enabled by default. When enabled, the default colors are black text on a yellow background. You can customize your Alert-Warning colors on the Color tab. Shows error messages like ORDER HAS BEEN REJECTED. Enabled by default. The default colors for are white text on black background. Shows fill records. Enabled by default. Sets whether to include Price Differential w/ Fractions in the Autospreader Instrument Configuration Based On field. Sets a visible indicator when a new fill appears in the Fill window. Saves all manual fills to your hard drive. When enabled, you are prompted to log into all exchanges where you have manual fills. If disabled, you lose your manual fills when you log out. Sets how often the indicator bar updates and displays new orders. Highlights the average open price long and short in the Price column. Note: Rounds longs up and shorts down. Keeps bid and ask column colors even if they have not traded. Turns MD Trader gray when the order server is unavailable. Enabled by default. Lets you hide your position with a right-click on the position field. Right-click again to show your position. Disabled by default. Bolds dividing line between the best bid and best ask. Double-click the Price column to recenter the MD Trader grid. Displays total volume at price as text when you hover the mouse over the particular cell in the Last Traded Quantity column. Sets mouse button actions to immediately activate when the mouse is clicked (not released). Delete all when LTQ column clicked Lets you delete all your working orders by clicking in the Last Traded Quantity column. Provides a confirmation step before submitting orders. To use this property for a single order, disable it here. Then, click the Confirm checkbox in the pane. This box is located above the Buy and Sell button. Sets Order Entry panes to open with the Hold option checked. Enables a message box asking 'Cancel all orders?' when you choose to Cancel all in the Orders and Fills Window, via a hotkey, or the Del button in the Market Grid. Shows the pre-set quantity buttons next to the price and quantity input fields in the Order Modification pane. Original Quantity: Just the order's original quantity regardless of partial fills. Work Quantity: The current working quantity of the order, taking partial fills into consideration. Update time for new orders (seconds): Sets how often the indicator bar updates and displays new orders. Adds or removes any manual fills you entered into the position totals and recalculates your P/L. Displays the exchange name in the title bar of each contract in the Quote Board. Specifies whether to use color coding for price levels. Displays color coding of the Net Change column. You can customize your net change colors on the Color tab. Displays color coding of Net Position column. You can customize your position colors on the Color tab. Displays the top of book price in a different size font and color. Used for the Market Grid and Spread Matrix. You can customize your top of book colors on the Color tab. Color codes the Market Depth by price level For All Levels or From 2nd Level on. You can customize your market depth colors on the Color tab. Highlights the best price in the market. Set a border width using the arrows. Displays implied price and quantity data as calculated by the Exchange in the same columns as direct price and quantity data. 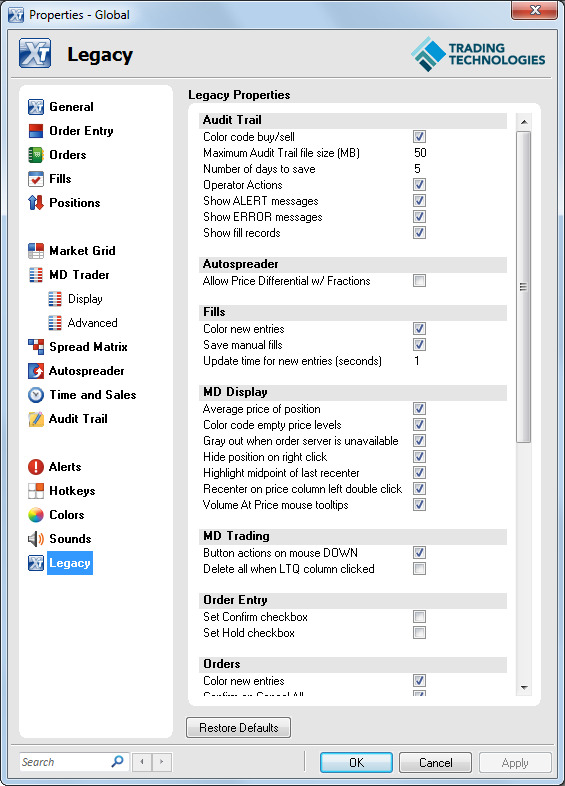 Implied data displays in the Market Grid, MD Trader, Autospreader, and Autotrader. Indicates the maximum number of depth levels, between 3 and 20, displayed for Bids and Offers. This setting will not override the maximum depth each gateway displays. Example: If you set this value to 8 but the exchange limits maximum depth to 5 bids and 5 offers, you will only see five levels. When both the quantity and price change.When the Last Traded Price (LTP) is on the bid or ask. If the Last Traded Price was not on the bid or ask, the grid does not highlight. Used for the Market Grid and Spread Matrix. Enabled by default. Specifies how to display the strike pice for options. Call+Put: Displays each strike on a single line of the Market Grid, with the calls on the left side and the puts on the right. Call/Put: Displays each strike on two lines of the Market Grid, with the calls placed directly over the puts. Enables a price reasonability by the exchange. Lets you choose your ¼ 32nd rounding options. It applies to all orders you enter except Autospreader and Autotrader orders, and Stop orders that always round away from the market. None: Sends order at your selected price. If the price is not tradable, the exchange rejects the order. Aggressively: Rounds ¼ tick prices towards the market. Conservatively: Rounds ¼ tick prices away from the market. Enables the Admin Alert Messages dialog box, which lets you receive messages from your risk manager or an administrator.